The Click CF8 Premium Rigger Boot is a lined rigger boot incorporating an external TPU heel support. The dual density PU sole unit has a shock absorbing heel with anti-slip and anti-static characteristics. Durable Apollo leather upper. 200 Joule steel toe cap and midsole that conforms to EN345 S1P. The padded ankle and fur lining ensures all day comfort. The TPU structured heel support provides visible ankle support! Sole resistant to oil, acid and alkali. 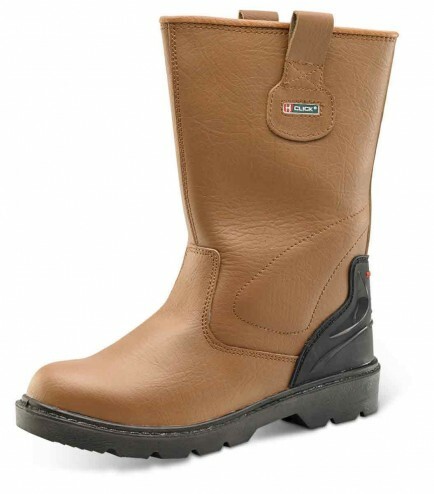 The Click CF8 is an ideal rigger boot for your work site.